At 28 by 14 inches, this oil painting I made is one of the largest in my tool portrait series. 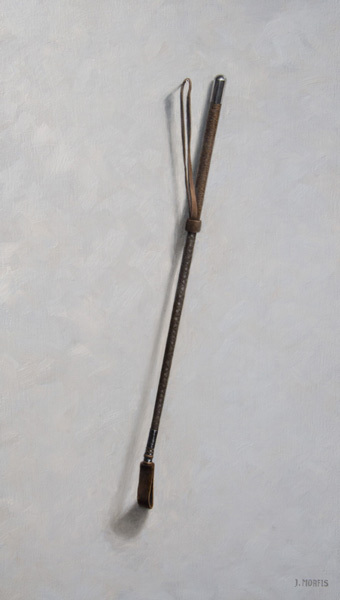 This horse riding crop belongs to Carol’s daughter Morgan so was named accordingly. 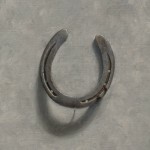 This painting makes number 4 in my growing sub-series of horse tack artwork. Because this canvas was so large I chose to stretch it around over sized stretcher bars; the type that are nearly 2 inches thick. Talk about some serious hunks of lumber! As always I did some composing by positioning the riding crop on different nails within my staging area and played around with the lighting. I quickly saw that this painting was going to have some unique compositional issues that I had not faced before. With all my tool portraits and horse tack portraits I strive to create a balanced work of art. Since I generally paint one item per painting this usually means I am utilizing a very symmetrical composition. The nail that a tool suspends from is always in the center of the composition as measured horizontally. The riding crop didn’t allow for this. What to do? When hanging from its strap the riding crop hung on an angle that was not equally distributed. I attempted a layout of the painting that had the nail in the center…it didn’t look quite right. Too much of the crop was towards the left. The composition was very heavy on the left-hand side. To compensate for this imbalance I elected to move the nail slightly to the right so that the slanted riding crop seemed to occupy approximated the same about of space in the left and right halves of the painting. I tend to do a lot of this kind of thinking when I set up my items to turn into paintings. 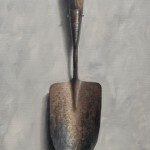 Someone might take a quick look and think, “It’s only a hammer.” Or, “He just painted a shovel.” But, I put much thought into placement and weighting of the forms. I also think about the cast shadow and how that affects the overall weight of the composition. 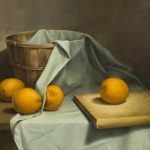 We often think of shadows as nothing, but they become an integral part of an artwork’s composition and must be considered with great care for any successful painting.